The main character is a boy called Eragon and he finds what he thinks is a stone, but turns out to be a dragon egg. The egg hatches but the Rezarks (monsters) come looking for the dragon egg and destroy Eragon's home. Rated: 5/5 - "I loved it - it is now my new favourite book!" A girl named Ingrid goes to the dentist and then to soccer training. On the way there a storm starts so she runs to the nearest house. The lady at the house rings for a taxi. The next day Ingrid realises that she left her soccer boots at the house. She then finds out that the lady has been murdered. Ingrid wants to find her soccer boots and solve the mystery of the murder. Ingrid also gets the role in a play for 'Alice in Wonderland'. Rated: 5/5 - "Really, really good book." Thomas arrives in a glade that turns out to be a maze. He has no idea how he got there. He hears lots of screaming and there are monsters in the maze. Everyone in the maze is male but the last person to appear is a female and she has a mysterious note in her hand. Thomas needs to find a way out. Rated: 5/5 - "Really good." There are five kids who name themselves 'The Findouters'. Someone has burnt down Mr Hick's workroom and they need to find clues to solve the mystery. They have suspects but have to figure out which one it was. Rated: 4½/5 - "Pretty good." A boy named Dwight has a finger puppet named Yoda, which is based on the Star Wars series. Yoda can tell the future and make it better. Dwight is sent away and the kids at his school want him back because they think he can tell the future (but it's his Yoda puppet which can). 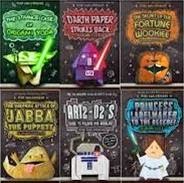 My favourite book in the series is 'Darth Paper'. Rated: 4/5 - "It's got action but I'd like more action." A boy who is bullied at school realises that the remote on the new TV his dad bought can stop and rewind things in real life. He tests the remote and pauses his dad during dinner and then on a fly in mid-air. To get the bully he enters a spaghetti competition and so does the bully. Whoever eats the most spaghetti without vomiting wins. With the remote he makes the food vomit in and out of the bully's mouth. 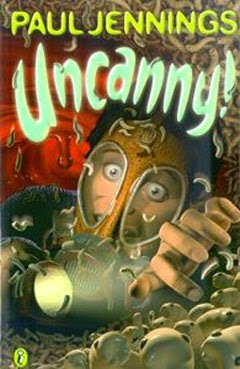 Rated: 5/5 - "Funny, I'm not into fairy stuff." My favourite bit in the book is when Captain Woodenhead tries to attack Terry, but he manages to escape because he is wearing inflatable underpants and is able to land on a roof. Rated: 5/5 - "Too good for words ...."
I have read this book before but decided to read it again. It is about the Baudelaire Orphans, they are orphans because their parents died when their house was on fire. They are adopted by Count Olaf, but he only wants their money which they inherited when their parents died. The only way he can get his hands on the money is if he marries Violet (who is only 14). He tries to trick Violet into marrying via a play (there is a marraige scene in it). Rated: 4/5 - "I knew the book and what was going to happen." I've just finished Harry Potter and the Chamber of Secrets. It's Harry's second year at Hogwarts. The first problem he has is that he and his best friend Ron can't get through the barrier at the train station. Eventually they decide to use Ron's dad's car to fly to Hogwarts where they land right into the Whomping Willow, a giant tree that hits out if you go near it. Then there is the problem of students dying or becoming petrified. It turns out that there is a giant snake called a Basilisk on the loose in Hogwarts and if you look into its eye you will die, if you look at it's eye via a mirror you turn to stone. Then Hermione is petrified and when they find her in the Hogwarts hospital she is still clutching a note in her hand which has information about where to find the Basilisk. Rated: 5/5 - "Like every other Harry Potter book - really good."